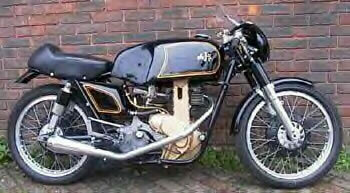 AJS introduced a new chain driven overhead cam single cylinder racing motorcycle for the 1948 season. Named the 7R it became a legend in its own lifetime winning numerous races at all levels including the Manx and Grand Prix, a tradition that it continues today in classic events. Like its major rival from Bracebridge Street, the 7R benefited from the experience gained with each passing season with refinements being incorporated into the following year's model. The models 29bhp rose steadily over its production life with the final models producing in the region of 39bhp. Of equal importance in aiding the 7R maintain its position at the front of the field was the attention paid to reducing the frontal area and consequently improving the machines overall performance. A side effect of the sliming down of the fuel and oil tanks and the reduction in the overall height of 7R was that it ended up as being one of the most attractive motorcycles ever produced. The driving force behind the 7R was Jock West, then the AMC sales director who championed the concept of an over the counter 350cc racing machine at boardroom level. The design itself was largely the responsibility of chief designer Philip Walker. The new model benefited from the experience that the works team had gained with the twin cylinder, E90 Porcupine as far as the cycle parts were concerned, using a frame that owed much in general layout to the Porcupine. Teledraulic front forks, conical hubs with a twin leading shoe front brake and a pivoted fork rear end controlled by AMC's early "candlestick" suspension units were employed. A Burman four speed gearbox with close ratios transmitted the power, quoted at 28bhp @ 6800rpm, with a chain primary drive linking the engine to the transmission. For the 1950 season a number of revisions were made to the 7R. Lighter flywheels together with a stiffer crankpin and changes to the main bearings helped the engine to produce and deal with higher revs and a revised valve angle and larger inlet valve improved the engines ability to breathe. The transmission was amended with a new clutch design and lubricated primary drive transmitting the power to 7R50 gearbox.